This CL2 HDMI cable is rated for in-wall installations. It also has a built-in active signal booster that allows for a connection distance of up to 30 feet (10 m) between your HDMI devices, with no signal loss. The cable is also backward compatible with previous HDMI specifications and will work with all of your existing HDMI devices. The cable’s built-in amplifier circuitry actively boosts the HDMI signal with no external power required. It supports longer connections than regular HDMI. The active cable also features a thinner wire construction for more flexibility, making it ideal for in-wall installations. 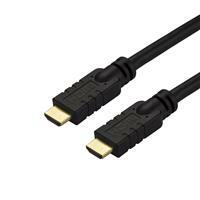 This 4K HDMI cable supports resolutions of up to 4K@60Hz (3840x2160p) and bandwidths of up to 18Gbps. It also supports HDR (High Dynamic Range) for higher contrast ratio and vivid colors. With higher resolutions, increased speeds, and sharper images, the cable provides the very best HDMI capabilities available today. 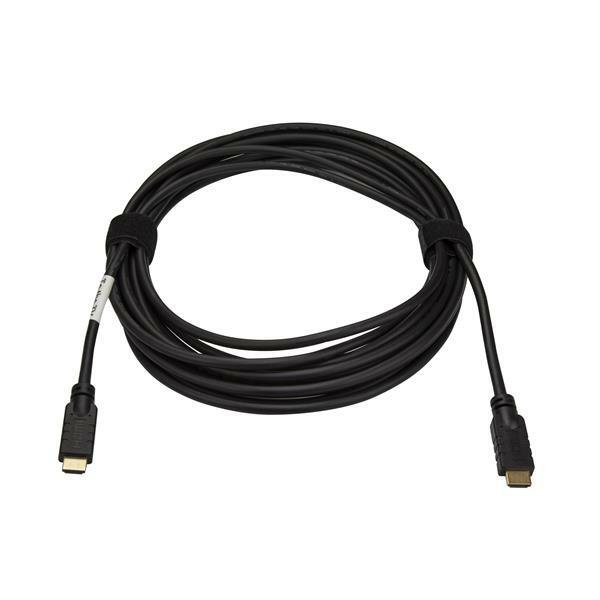 It’s the perfect cable for creating the ultimate home-theater experience, for providing lifelike digital signage, or for delivering exceptional presentations. The cable also supports up to 32 uncompressed digital audio channels to provide crystal-clear sound. The HD2MM10MA is backed by a StarTech.com 2-year Warranty. Note: This cable features unidirectional architecture which requires that the cable is installed in the correct direction. Please ensure that the HDMI connector labelled with "TV" is connected to the display, in order to ensure that the device and the HDMI source are connected properly. Note This cable features unidirectional architecture which requires that the cable is installed in the correct direction. Please ensure that the HDMI connector labelled with "TV" is connected to the display, in order to ensure that the device and the HDMI source are connected properly.